The Leh airport is situated about 8 kms. from the city centre. Leh is connected to Srinagar, Delhi and Jammu by air. Warning: Those with heart trouble or lungs problem should check with a doctor before flying to such a high altitude. Leh is about 434 km. from Srinagar and 739 km. from Jammu by road. There is a motorable road between Srinagar and Leh via Kargil. This road, which remains open for traffic from early June to November is the main land route to Ladakh. The most dramatic part of this road journey is the ascent up to the 11,500 feet or 3,505 m high Zoji-la. However, we recommend that the best way would be to go by road to Leh and return by air. Buses, Taxis, cars and jeeps are also available at Srinagar for the journey. 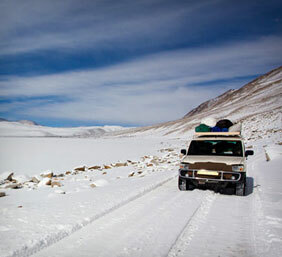 Recently, the 473-km Manali-Leh road has been serving as the second land approach to Ladakh. The Manali - Leh road weaves in and out among the mighty snow-clad peaks of the Western Himalayas over a stretch of nearly 485 kms. The road is open from mid-July to mid-October every year, depending on weather conditions. Manali is the starting point of this dramatic journey and Rohtang Pass(13,000 ft/3,978 m), 51 kms away is the first important milestone on the Manali - Leh road as it is the gateway to the Lahaul and Spiti valleys. This important road, which was once part of the ancient trade route between India and Central Asia, wends its way through breathtaking mountain views via the Rohtang Pass, Gramphoo, Kokhsar, Sissu, Gondla, Tandi. One can also reach Kaza, the main town of Lahaul and Spiti. Onward the road moves to the Bara Lachha Pass (4892 m or 16,050 feet), 73 kms from Keylong. Beyond this steep pass lies Sarchu, 43 kms away, in the adjoining state of Jammu and Kashmir. Now the trail hits the highest regions of Ladakh. A camping ground in Zanskar, litle before Sarchu, Phalang-danda (a giant rock) marks the boundary between Lahaul and Zanskar. Sarchu has wide open places and treks to Phirtse la starts from here. Just 54 kms. ahead of Sarchu, the road crosses Tsarap Chu over a bridge. Then it climbs up to Lachalang la Pass (16,600 feet or 5,059 m). Nearly 87 kms from Lachalang la pass is the Tanglang la pass, the highest point on this road. This pass is difficult to negotiate. By crossing this pass one enters the Central Ladakh. 60 kms ahead of Tanglang La pass is Upshi, a junction on the Indus. The road bifurcates from here towards Rupshu and for Demchok, and little ahead at Kiari for Chang la. Leh, the headquarters of Ladakh and well known tourist spot with an airstrip is about 50 kms from Upshi. The roads leads to Khardung la (in north) and to Kargil (in west). The bus journey between Leh and Manali takes about 19 hours or two days with an overnight halt in camps at Serchu or Pang. 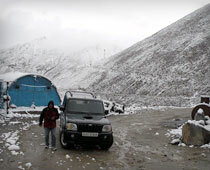 Gypsy and jeep taxis are also available, both at Manali and Leh. including internal transport. Detailed information about bus schedules, taxi tariff, travel agencies, etc. can be obtained from the Tourist Office.